This past Saturday was Olivia's birthday! We had been planning a party for a while, and I was not thrilled about trying to find party favors. I always end up not liking what I've picked out, and it usually is expensive. 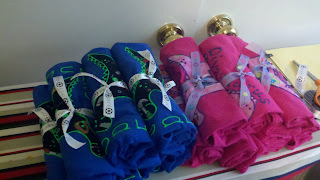 So this year, I decided to make t-shirt party favors! 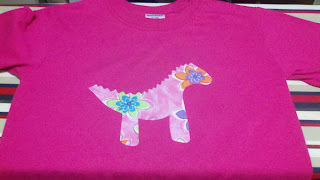 Olivia wanted a dinosaur party, with fuschia dinosaurs. 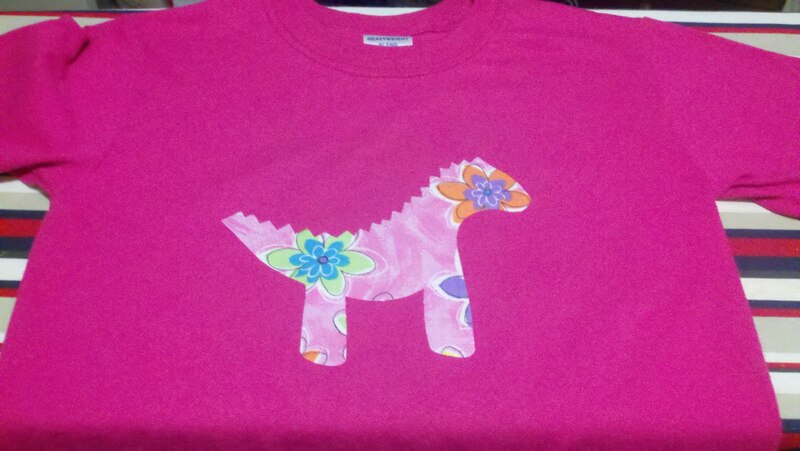 Fuschia is her favorite color. For the record, I had to use a dictionary to spell fuschia. 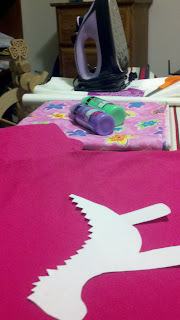 So, we are essentially making an applique, or an iron-on transfer. First, apply fusible web to your fabric, according to the instructions. 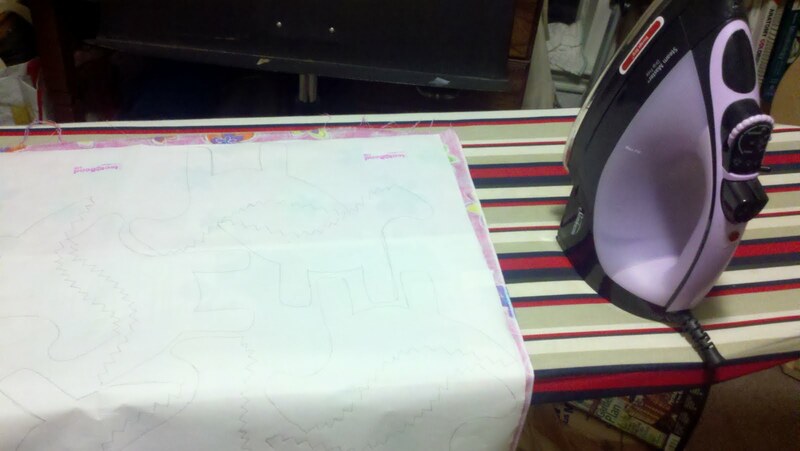 Don't forget to remove the instructions from the fusible web, or it will make a mess. Trust me. 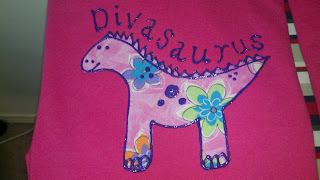 Then, take your applique shape (dinosaur) and trace as many shapes as you have t-shirts. 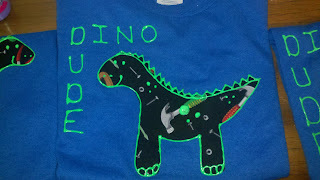 Cut all those shapes out (here is where I wished I hadn't made all those "spikes" on the dinosaur, but we figured without them it looked like a horse...) and then iron them all onto your shirts! This is accomplished by peeling back the paper to reveal a shiny heat bondable side. 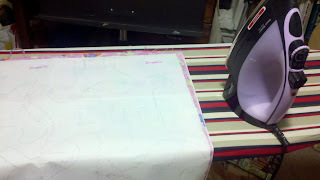 Put the shiny side down, right side of the fabric up, and press. Make sure they are pressed well. You don't want these to come off after one wash.
Time for paint! I slipped a sheet of thick paper between the two layers of t-shirt, just in case the paint were to bleed through (it didn't, but better safe than sorry). These take about four hours to dry well enough to stack them on top of each other, but 72 hours until they are ready for washing. I did mine in three shifts, doing the outline of the dinos first, and then going back for the lettering and finally the details of the dino. Cute presentation - roll them up and wrap with a little piece of ribbon! Good luck with your new project! I hope by now you have found a reliable solution to team up with for selling your stuff. You can even try Amazon and other eCommerce platforms as well.